This badge was issued to Robert D. Andrews on 07 May 2018. 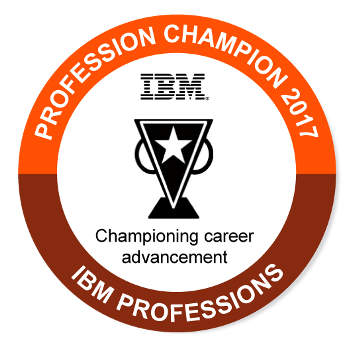 This badge holder is recognized for significant contribution to IBM Professions to guide IBM employees on the skills, experiences and training they need to advance their careers, and to enable them to provide value to their clients. The professions require the engagement of individual contributors to stay viable and current. The Profession Champion dedicated time beyond his or her primary responsibilities to contribute directly to profession sponsored activities.